I am trained as an architect and urban planner and have more than ten years experience in cartography and data visualization. My work has been featured in a number of books, publications and research projects. 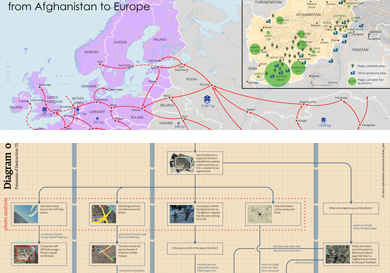 My approach to production of maps and infographics focuses on both function and aesthetic, making them equally indispensable and mutually complementing. I aim at visual presentation that contains highly detailed and comprehensive information laid out in a clear and simple way. Elegant design is a necessary feature of the end product. Please consult the Maps & Co. section on this blog, and/or the Cartography section on my website to see some examples of my work. Each project is developed upon a detailed discussion with the customer concerning the content, visual style and the audience. Just wanted to say that your work is great! Specially your unbiased,fact-based investigations into the Syrian war. Although sometimes the results of these investigations don’t match my liking, I must salute you for your brilliant sense of journalism. If only more Arab media relied on approaches like yours instead of pure sectarian propaganda. I will be following your elegant blog closely and enjoying your reports. On a final note, did you publish anything on security incidents in 2012-2014? I have a theory that these incidents tend to become more often before tourist seasons, in a systematic attempt to hurt Lebanon’s already weakened economy. For the Security Incidents, 2012 & 2013 were not produced. 2014 is still pending funds. The hypothesis linking incidents with tourism is mainly propagated by Lebanese Politicians, and i highly doubt its pertinence.